Description: This very beautiful property with a size of ca. 14.800 sqm is surrounded by nature in one of the best wine regions of Italy, the Collio. 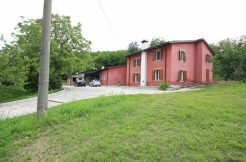 It is composed of two buildings, the villa with a big living and dining room with kitchen and six bedrooms and the outbuilding, a former stable, with a big living area and kitchen on the ground floor as well as a bis sunny terrace. Both houses have been totally renovated and lovely furnished in the year 2010. The property is suited to a B&B during the summer months. Rental: The rental can be made via the platform HomeAway.